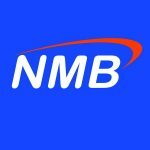 NMB is one of the largest commercial banks in Tanzania, providing banking services to individuals, small to medium sized corporate clients, as well as large businesses. It was established in 1997 following the break-up of the old National Bank of Commerce which resulted to three new entities namely: NBC Holding Limited, National Bank of Commerce Limited and National Microfinance Bank Limited. NMB listed 500,000,000 shares in DSE on 31st of October 2008 at an IPO price of 600 per share but it has been opening and closing at 2750 for more than two years.